Hank and Drover are just beginning an investigation when a pirate suddenly appears on the front porch! They soon realize that the pirate is just Little Alfred in disguise. 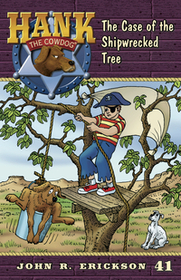 Alfred chooses Hank as his first mate, and Hank enthusiastically agrees to be hoisted up into the tree-house pirate ship...then remembers dogs don’t belong in trees! Can Hank survive his adventure on the high seas and return to shore in one piece?